You may have 500 Facebook friends and 2500 Twitter followers, but how influential are you really online? A free service called Klout can measure your online influence and teach you how to improve your presence. I’ve become more and more involved in social media over the past couple years and while I feel influential at times, it’s hard to know exactly how I impact others. I found a great tool that measures just that, and it’s called Klout.com, a free service that measures your online influence over others. The way Klout works is simple: you log on using your Facebook or Twitter account, connect it to your other social media accounts (i.e. Google+, LinkedIn, Foursquare, WordPress, YouTube, etc;) and it analyzes your social interactions to score you between 1 and 100. This score can help you understand how much others trust your opinions, topics about which you are influential and how influential others in your social network are. You can also give and receive Klout K+ points which increase how influential you or others are on particular topics. If you do not receive enough K+ points and do not seem to be influential enough about your topics online, you will no longer have those topics listed on your profile. It’s okay to not have topics listed, however they help others to understand what you are influential about and can increase their likelihood of following you. Some of the actions that influence your Klout score are re-tweets and mentions on Twitter, comments and likes on Facebook, and re-shares and comments on Google+. After your influence has been analyzed, you are placed into a category or “Klout Style” based upon your social interactions. Currently, my score is around 50 and I am considered a specialist: someone who has a specifically focused topic and a highly-engaged audience. This is great for me, because I have been focusing on sticking to specific topics on my Twitter account and the majority of those I follow as well as my followers share the same interest in those topics. 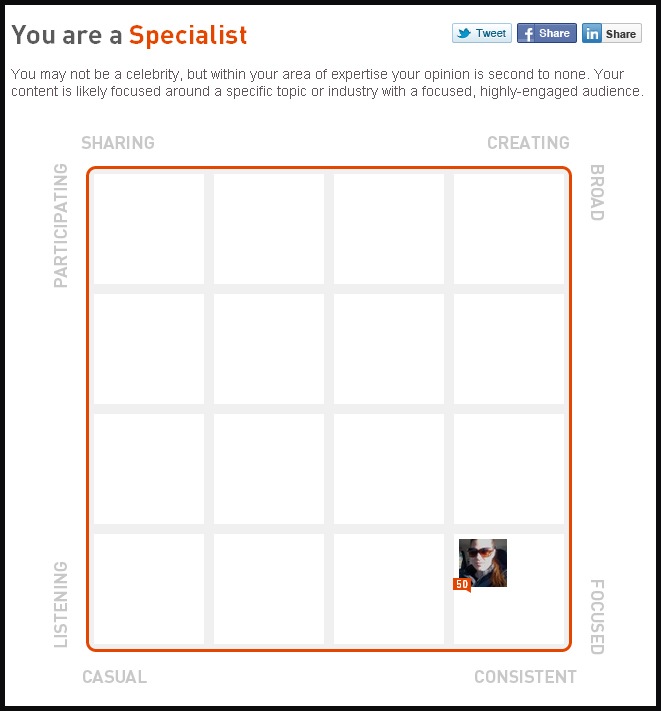 If you are interested in your Klout score, then you are most likely interested in improving your social influence. One way is to review your score on a daily basis to see how your interactions impact your score. Ask your network an open-ended question or post a link to a must-read article. Make an effort to comment on others’ posts, re-tweet, and respond to their comments on your posts. Every interaction can help increase your score. Or perhaps you would like to be more like someone you follow on Twitter. We’ll use Oprah Winfrey for example. 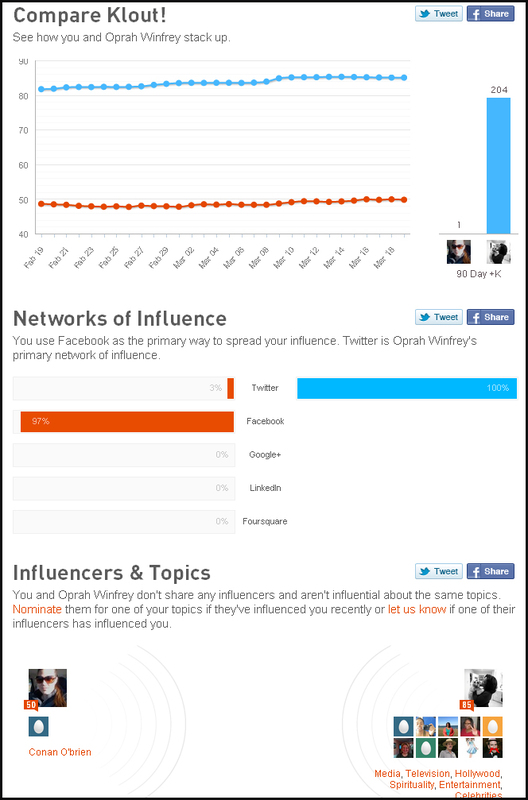 Oprah’s Klout score is 85 and her Klout Style is Celebrity. Granted, I’m not a celebrity like she is, but if I want to shift my influence to match Oprah’s, I can view Klout’s comparison to understand how she uses social media, who she influences and topics on which she is most influential. Looking at our comparison, her main network is Twitter, while mine is Facebook. We don’t share any of the same influencers and are not influential about the same topics. So how can I change this? For starters, I can steer my focus on Twitter rather than Facebook. I can check out her influencers and follow them so we start to build similar networks. Next, I can review her topics and start posting about the same topics in which I am interested (we want to keep this organic over copycat). Finally, I can get my friends on Klout to give me Klout K+ points on my topics to keep my topic scores high. If you understand the influence you have over others, you can improve your use of social media to reach your network more effectively. You can also understand who you influence the most to cater your posts to those who are most interested or change your message to appeal to a larger audience. Do you use Klout? How has it helped you better reach your audience? Previous Previous post: Managers: What do you wish your employees knew?